A topic on every citizen’s mind is what the impact of the recent junk status downgrading from Standard and Poor’s, in addition to Fitch, will have on the South African economy. I felt compelled to perform my own analysis on what the likely ripple effects will be, specifically within the context of retail property management. Vizibiliti Insight generates an integrated macro environment risk score using the variables to follow, for landlords to monitor a tenant’s business cycle and the effect on their ability to fulfill lease commitments. Vizibiliti uses this insight to predict and prevent late payments and write-offs by enabling property managers to formulate proactive decisive strategies when a tenant has been identified as likely to pay late at the point of invoice captured date. Armed with this insight landlords are forewarned, three months or more in advance, to the late payment, allowing them to take immediate action thereby preventing the risk from occurring. The unfortunate series of events in South African politics, has led to consequences for the economic environment. The downgrading of the country’s sovereign credit rating to junk status is just one of them. Let’s take a look at the impact of junk status on a 4- factor model comprising markets, growth, inflation and employment that provides data-driven insight into retail property management risk. Junk status negatively impacts the government issued 10-year bonds – meaning government will likely pay a higher interest rate on its loans. Increasing the interest rate on 10-year bonds will be necessary to account for the increasing uncertainty regarding their ability to repay those loans. 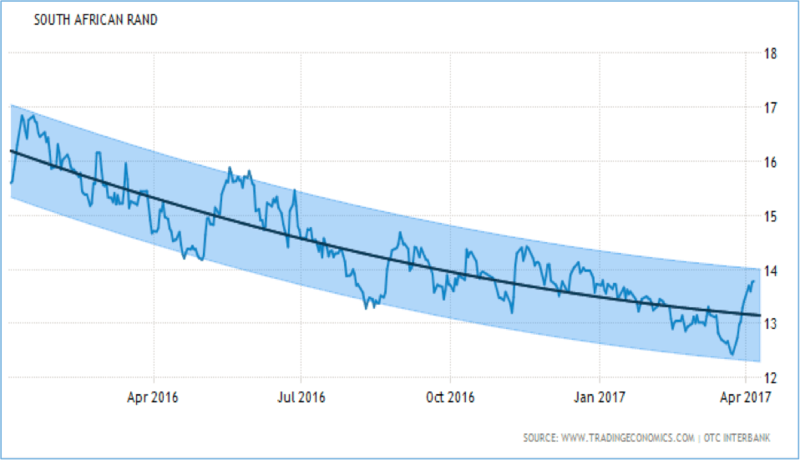 We may see the aforementioned elevation in interest rate on the 10-year bond, in 2018. 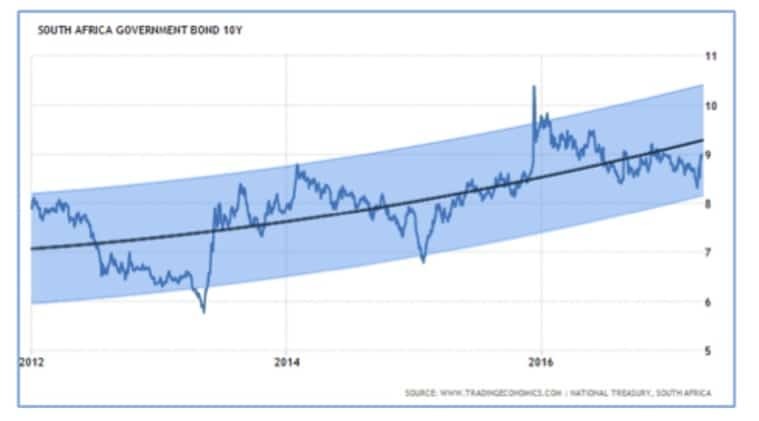 The chart below, confirms the long-term trend of interest rates surging to new highs next year. The currency and stock market represented by the Allshare looks to be range bound for the year ahead. The long-term view between 1 and 3 years is the timeframe I use to monitor the macro environment and the impact on tenant payment risk. 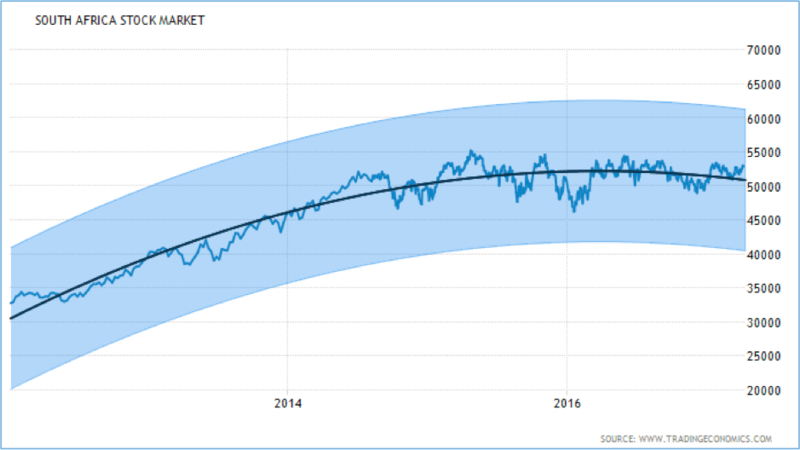 The blue line represents actual figures, while the black line represents an autoregressive predictive model provided by www.tradingeconomics.com. The blue range represents a probabilistic range of the predicted figures. Within the growth category Vizibiliti Insight monitors GDP, consumer expenditures, retail sales, vehicle sales as well as business and consumer confidence. These areas are likely to decrease with the move to junk status due to the impact of higher interest rates and inflation, reducing the amount of disposable consumer income. Less income in consumers’ wallets forces them to spend less and economic growth represented by retail and vehicle sales will likely accelerate to downwards. As per the images below, business and consumer confidence, retail and vehicles sales were trending downward before the announcements. What is most concerning is that retail sales growth decelerated the fastest in 5 years during January 2017. The move to junk status will likely stimulate decreasing trends and propel South Africa into a recession sooner. Within the inflation category, Vizibiliti Insight monitors interest rates via the repo rate, consumer price inflation and its subcomponents. The government uses interest rates to curb inflation and therefore is tightly coupled. The interest and inflation trends below are increasing and the effect is that consumers are likely to pay higher prices going forward. Vizibiliti monitors employment trends across a variety of variables such as unemployment rate, national and provincial employment growth as well as provincial net migration trends. The insight derived from such analysis offers a detailed view into whether consumers are going to continue spending money at their local malls. South African unemployment trends are expanding due to the dire interest rate, inflation and growth prospects. Retailers should be concerned as the economic growth “tide” is certainly against them. With growth and consumption measures trending downward, inflation and interest rates trending upwards, the South African economy and consumer market is in a fragile state. The risk to property managers is that their tenants are going to be under more pressure in the next year to make sales targets. Not meeting their targets will reduce their capacity to pay their creditors. Landlords could potentially renegotiate lease agreements with their tenants or perform surety reviews, consequently mitigating the intensifying stress macro environment factors are exerting on tenant payment behaviour. These are just a few of the action steps one could take, but I am sure many more exist. Please feel free to reach out to Vizibiliti Insight and share your thoughts in respect of, what you or others are doing to prepare for the potential danger ahead.